"There is more than one world"
Charles Stross, originally uploaded by alister. 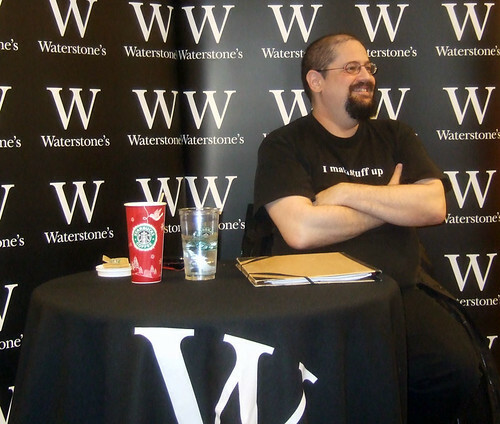 The writer Charles Stross gave a reading last night in Edinburgh Waterstones. The Edinburgh author was launching the latest book in his 'Merchant Princes' series - the Clan Corporate - which is an epic fantasy (or sociological sci-fi if you prefer) dealing with alternate realities and diverging timelines. One of the things I like about listening to Charlie or reading his blog is that he always has an informed and incisive point of view and he is amusing with it. Last night was no different and we were treated not only to a reading but also to some great Stross insights. Here is a wee clip where Charlie outlines the inspirations for his current series. In other local author news it was nice to finally meet Ken MacLeod and if you are an Iain Banks fan then you might want to check out his new forum. I was there! Heard you talking to Ken but didn't get a chance to introduce myself. Cool. Yes I enjoyed the reading and am enjoying the book too. I think I prefer the more fantasy type stuff to the straight SF.